Same bright, true colors as watercolors?without the mess. 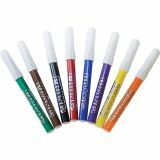 Classic colors blend with other colors to create secondary colors, or use brush and water for watercolor effects. Note: A minimum quantity of 138 must be ordered, and in units of 6 thereafter. 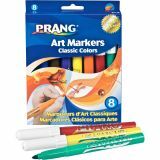 Prang Art Markers - Brilliant colors won?t bleed through paper. Long-lasting tips hold up to everyday use. 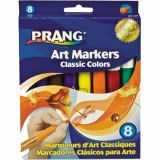 Prang?s ink formula allows for a 24-hour cap-off life before significant drying occurs. Prang markers are school approved. Create exciting watercolor effects by blending with brush and water. Certified AP nontoxic.